[131 Pages Report] The logistics automation market was valued at USD 42.80 Billion in 2017 and is projected to reach USD 80.64 Billion by 2023, at a CAGR of 11.8% from 2018 to 2023. The base year considered for the study is 2017 and the forecast period is from 2018 to 2023. The research methodology used to estimate and forecast the size of the logistics automation market began with capturing data on key vendor revenues through secondary research. Secondary sources referred for this research study included annual reports, white papers, certified publications, databases, such as Factiva and Bloomberg, press releases, and investor presentations of logistics automation solution vendors, as well as articles from recognized industry associations, statistics bureaus, and government publishing sources. Vendor offerings were also taken into consideration to determine the market segmentation. The bottom-up procedure was employed to arrive at the overall size of the market by estimating revenues of key market players. 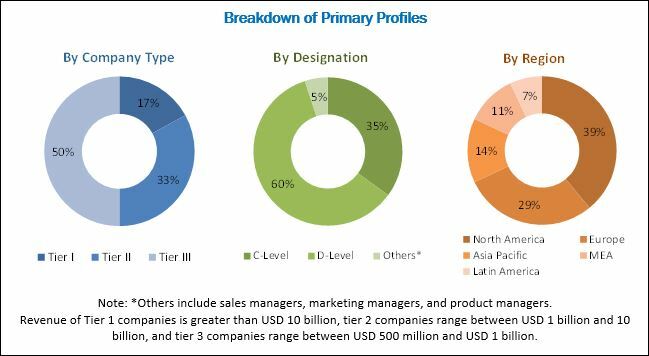 After arriving at the overall market size, the total market was split into several segments and subsegments, which were then verified through primary research by conducting extensive interviews with key personnel, such as Chief Executive Officers (CEOs), Vice Presidents (VPs), directors, and executives. Data triangulation and market breakdown procedures were employed to complete the overall market engineering process and arrive at the exact statistics for all segments and subsegments listed in this report. The logistics automation market ecosystem includes key players, such Dematic Corporation (US), Daifuku Co., Ltd. (Japan), Murata Machinery, Ltd. (Japan), Honeywell Intelligrated, Inc. (US), KNAPP AG (Austria), Swisslog Holding AG (Switzerland), TGW Logistics Group GmbH (Austria), SSI Schaefer AG (Switzerland), Mecalux, S.A. (Spain), VITRONIC (Germany), BEUMER Group (Germany), Toshiba Logistics Corporation (Japan), Jungheinrich AG (Germany), WiseTech Global Limited (Australia), System Logistics Spa (Italy), Falcon Autotech (India), SI Systems, LLC (US), ULMA Handling Systems (Spain), Inspirage (US), FRAMOS (Germany), Matternet Inc. (US), Pcdata BV (Netherlands), Hinditron (India), JBT Corporation (US), and OPEX Corporation (New Jersey). The logistics automation market is projected to grow from USD 46.22 Billion in 2018 to USD 80.64 Billion by 2023, at a CAGR of 11.8% during the forecast period. The growth of the market can be attributed to the exponential growth of the e-commerce industry, advancements in robotics, and the emergence of IoT. The implementation of driverless vehicles and drones is playing a vital role in automating logistics processes and providing lucrative growth opportunities to vendors of logistics automation solutions. With advancements in IoT technology, a huge amount of data is generated, collected, processed, and shared with other connected systems through various networking devices, such as gateway, Radio Frequency Identification (RFID), and sensors. There has been an increasing demand for connected technologies, connected applications, and smart devices from various industries worldwide. IoT plays a vital role to enhance connectivity and automation, thereby resulting in organizations utilizing IoT technology to enable warehouses to be more productive and cost-efficient. The implementation of IoT technology for logistics management has helped companies track material deliveries and monitor sensitive goods to avoid losses as well as mitigate risks involved in the transportation of goods. 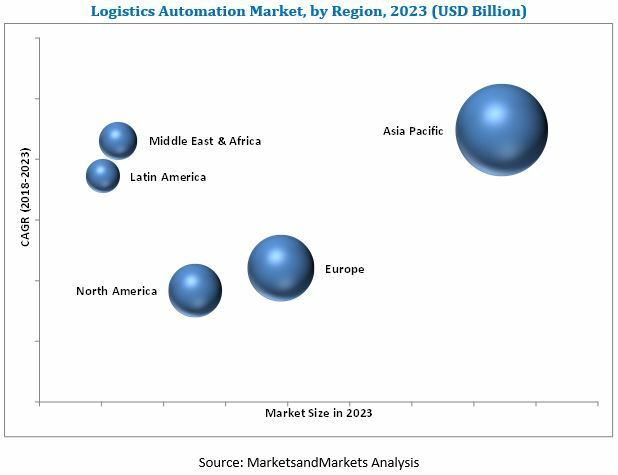 The logistics automation market has been segmented on the basis of component, organization size, vertical, and region. Based on component, the market has been classified into warehouse & storage management and transportation management. Based on organization size, the market has been segmented into large enterprises and Small & Medium-sized Enterprises (SMEs). Based on vertical, the market has been categorized into retail & e-commerce, manufacturing, oil, gas & energy, pharmaceuticals & healthcare, logistics & transportation, automotive, aerospace & defense, food & beverage, chemicals, and others (BFSI, IT & telecommunication, hospitality, education, paper, printing, and textiles). Based on region, the market has been segmented into North America, Europe, Asia Pacific, the Middle East & Africa, and Latin America. Based on organization size, the small & medium-sized enterprises segment is expected to grow at a higher CAGR as compared to the large enterprises segment from 2018 to 2023. With advancements in automation technology and intense competition among vendors, the cost of automating warehouses is declining. This, in turn, enables SMEs to adopt automation solutions and services in the near future. Based on vertical, the retail & e-commerce segment is projected to lead the logistics automation market from 2018 to 2023. The growth of the retail & e-commerce segment can be attributed to the increasing adoption of logistics automation solutions by retail and e-commerce companies. In addition, the demand for automated production and flexible logistics systems is a significant factor contributing to the growth of the market for the retail & e-commerce vertical. North America is estimated to be the largest market for logistics automation in 2018. Companies in the North American region are adopting logistics automation solutions to improve supply chain operations, including manufacturing, assembling, and transporting goods. The US, Canada, and Mexico are key countries considered for market analytics in the North American region. Economic growth of these countries has led to increased investments in the field of logistics automation. A key restraining factor impacting the growth of the logistics automation market is the requirement of high capital investments to deploy logistics automation solutions. The setting up of large-scale automated warehouse facilities involves the installation of automation equipment, software, and solutions, which incur heavy expenses. It is not viable for several companies to replace their existing logistics processes, due to the high cost of new and advanced systems. Automation systems used in industries require maintenance and upgrades occasionally, involving high capital re-investment. Thus, companies with limited financial resources are unable to opt for automation systems, thereby acting as a restraint to the growth of the market. Key players operating in the logistics automation market include Dematic Corporation (US), Daifuku Co., Ltd. (Japan), Murata Machinery, Ltd. (Japan), Honeywell Intelligrated, Inc. (US), KNAPP AG (Austria), Swisslog Holding AG (Switzerland), TGW Logistics Group GmbH (Austria), SSI Schaefer AG (Switzerland), Mecalux, S.A. (Spain), VITRONIC (Germany), BEUMER Group (Germany), Toshiba Logistics Corporation (Japan), Jungheinrich AG (Germany), WiseTech Global Limited (Australia), System Logistics Spa (Italy), Falcon Autotech (India), SI Systems, LLC (US), ULMA Handling Systems (Spain), Inspirage (US), FRAMOS (Germany), Matternet Inc. (US), Pcdata BV (Netherlands), Hinditron (India), and JBT Corporation (US). These companies focus on the adoption of various growth strategies, such as new product launches, product enhancements, agreements, partnerships, and collaborations, to strengthen their position in the market. *Details on Business Overview, Solutions, Software & Services Offered, Recent Developments, SWOT Analysis and MnM View Might Not Be Captured in Case of Unlisted Companies.